ELK GARDEN, W.Va., May 13, 2017 — Craig Westfall made his first trip up the hill a memorable one. 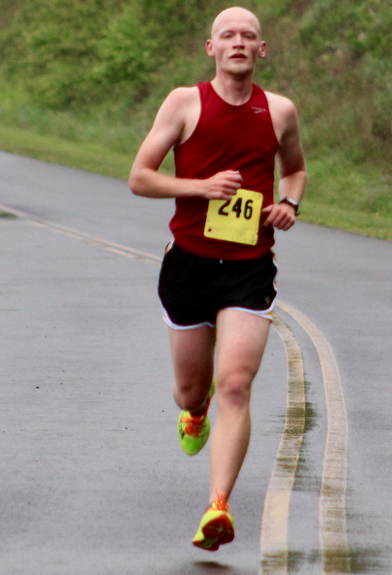 The 21-year-old from Keyser, W.Va., led the field of 87 participants of the sixth annual Conquer the Dam 5K at Jennings Randolph Lake to the finish line. The finish line is conveniently situated adjacent to the paved road that directs motorists to Howell Run — and it’s at the top of a long, difficult incline. Craig Westfall strolls to the finish line at the end of the sixth annual Conquer the Dam 5K at Jennings-Randolph Lake in Elk Garden, W.V. Westfall bested the best effort by defending champion Colby Mallery, 13, of Mount Savage, Md., to stop the clock in 19 minutes and 17 seconds. Mallery was second this year in 21:28, less than six seconds (21:22.7) off his winning time in 2016. Edward Chamberlayne, 45, of Falls Church, Va., finished fifth overall and the top Masters (40-plus) runner in the field with a time of 24:31. Krystal Stair improved on her 2016 performance in which the 30-year-old from Cumberland, Md., finished eighth in 25:00.7. This time around, she took advantage of an unseasonable cool temperature of about 45 degrees with an overcast sky and a bit of a mist — quite refreshing for a distance runner. Stair this year finished fourth overall and knocked close to two minutes off last year’s effort, crossing the finish line this time in 23:13. The race for second in the women’s standings was a close one between three runners who finished only five seconds apart. 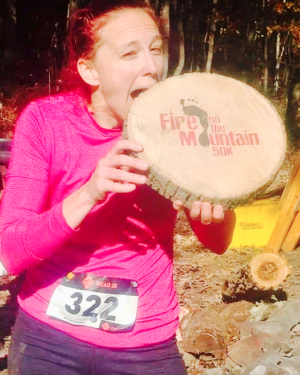 Ashley Lease, 34, of Ridgeley, W.Va., finished 10th overall in 27:42; Hosanna Barrett, 17, of Keyser, W.Va., was 11th in 27:46 and Amy Clem, 31, of Cumberland, Md., was 12th in 27:47. Jamie Gera, 40, of Keyser, W.Va., finished atop the women’s Masters division with a time of 30:07, good for 17th overall. The annual run/walk raises funds to support the Meals on Wheels program administered by Aging and Family Services of Mineral County.